Hello and welcome to the web site of Phil Evans, one of Wales’ top and well established stand up comedians, with many TV and radio credits. Born, bred and still residing in South Wales, UK. ( “ for tax purposes! 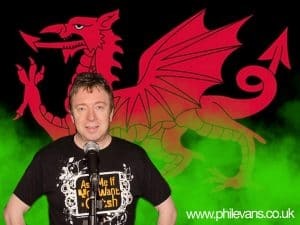 “ ) Phil has a distinctive Welsh accent, easily understood, but blessed with just enough of a lilt to give his stand up comedy the warmth, friendliness and charm associated with the Welsh. Comedian Phil Evans can often be seen wandering about in his special T- shirt emblazoned with the words “Ask me if you want a Cwtsh”! It’s true, you can only get a Cwtsh in Wales. If you don’t know what a Cwtsh is then it’s time you found out and asked him. You will be pleasantly surprised and it might even brighten your day! All that Phil asks in return is that you pass the Cwtsh onto someone else as quickly as you can! You know you want too! Merchandise: Contact Phil for a Cwtsh T- shirt – Cwtsh Mugs & Cwtsh Cards. The unique and perfect gift for that special person in your life. Why not book the ‘Phil Evans and Friends Show’?